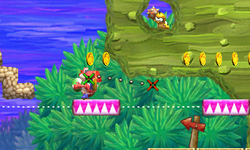 Hidey-Hole Hooligans is the seventh level of World 2 found in Yoshi's New Island. Yoshi starts the level in a jungle-like area with Wall Lakitus and a Mega Eggdozer which can be used to open up the path to a nearby door. It leads to the Checkpoint Ring and a set of moving platforms which can be used to reach a door where Yoshi transforms into a Helicopter and must go through an obstacle course to reach another area. Here waits another Checkpoint Ring and a level segment which requires Yoshi to run across some Donut Lifts to reach the Goal Ring.